Stambolovo Winery – producer of red and white wines. High-quality Merlot wines from Stambolovo and Sakar regions in Bulgaria. Incorporated under the legal entity of New Industrial Company JCS, STAMBOLOVO WINERY, allied with the former HASKOVO WINERY, is the direct successor to the history and traditions of Patkovi Winemaking Firm, founded in 1932. At present our winery is among the most prominent factors of Bulgarian wine-producing industry. The annual production capacity of wines and wine brandies exceeds 3 million litres. A substantial part of our total production of wine is exported to more than a dozen destinations worldwide. 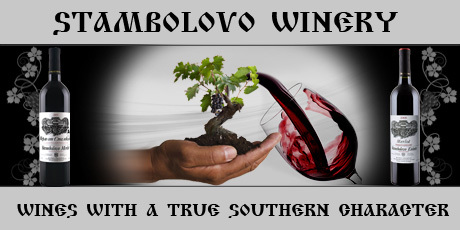 STAMBOLOVO WINERY is located in the south of Bulgaria and falls within the Tracian Valley vine-growing region. The winery is specialized in the production of high-quality wines and wine brandies made of white and red grape varieties. Our wine assortment covers a very wide range of products - starting from mass table wines, varietal and blended wines, reserve type wines and up to special selection wines. A matter of great pride and attention for us are our stocks of high-quality aged Merlot AOC wines from the regions of Stambolovo and Sakar with vintages from 1986 to-date, which are internationally famous and considered to be the most typical and valued paragons of Bulgarian Merlot wines in the world. STAMBOLOVO WINERY is a part of Bulgaria's Southern Route of Wine. In the last few decades our company has been developing and maintaining programmes for wine tasting tourism.